Political uncertainty, the threat of terrorism and gloomy economic prospects aren't exactly making Britain a very fun place to live in 2017; it's at times like this that I find myself getting all nostalgic for simpler times when it seemed like all I had to worry about was what was going to be on TV that week. And, in particular, I really miss the TV presenters from way back in the day. With their cheery smiles, regional accents and retrospectively hideous suits/blouses, you were guaranteed a regular dose of security and comfort every time you turned the TV on. Whilst reminiscing about this bygone era, I suddenly had a brainwave. Why not use these delightful TV presenters of yesteryear to bring a bit more charm and security to these trepidatious times we live in. And that's why I brightened up the modern world with retro TV presenters. I quite often have to stop off in this squalid and depressing toilet at a petrol station on my commute home from work and it's fair to say this toilet has seen better days. However, with ex-Central presenter Andy Craig now positioned at the perfect height to chat to as you go about your business, it's been given a whole new lease of life. This steel monstrosity of a lift reminded me very much of Theresa May in its stark coldness and it was most certainly the last place I would want to get trapped. People do, though, get stuck in lifts and I'm told it's a real exercise in anxiety and panic. 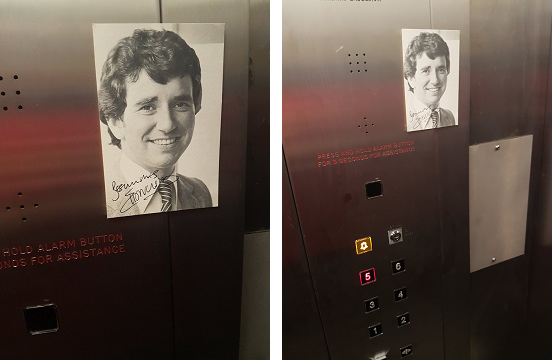 Therefore, I employed the services of ex-Granada presenter Elton Welsby to bring a reassuring smile with a perfectly measured dose of warmth to make this lift the type of place you'd like to spend all night. The discarded can of Tyskie down by this abandoned bit of land at the docks highlights the realities of Britain's drinking problems. I'm all for drink, but I believe that it should be used to celebrate rather than numb the reality that another series of Love Island has started. 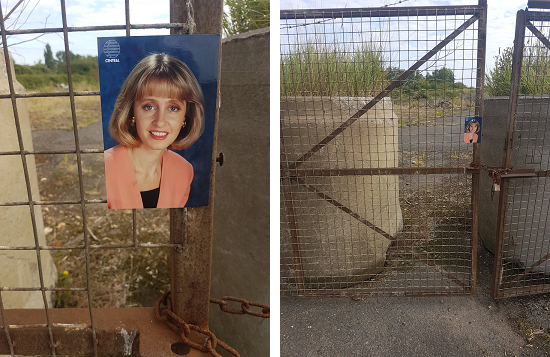 And that's why I decided to leave a picture of ex-Central reporter Sandy Barton as a reminder of the good things in life for the poor soul who flung their Tyskie up here in an existential rage. Loneliness is a huge problem in modern Britain and this is a problem that I thought ex-Television South presenter Mike Debens could help solve. Finding the loneliest looking bench in my local park, I attached a photo of Mike Debens to it in order to give lonely souls someone to sit next to and have a little chat with. The housing crisis is another issue that blights Britain in 2017, so it's particularly galling to see such huge swathes of unused land just fenced off and left to cultivate weeds and high grass. Perhaps the developers aren't entirely aware of just how amazing the impact of a community can be. Therefore, I thought I'd kickstart the regeneration project needed at this desolate expanse of land by giving it an instant facelift with ex-Top Gear and Central News presenter Michele Newman. I spotted another patch of wasteland that was becoming little more than a dumping ground when it could be doing so much more for society, so it was time for me to intervene. This particular piece of desolate land is housed next to several housing estates, but has lain empty for several years now. The owners aren't exactly helping to sell it, so I gave it the greatest promotional boost possible by installing the beaming smile of ex-Central and BBC presenter Bill Hanrahan to greet visitors. The filthy, stained floor, the stark piping and discarded pack of cheap cigarettes that decorated the corner of this already grim car park were enough to demoralise even the most hardy of souls. And, after a hard afternoon's shopping, did the general public deserve to be faced with this as they returned to their cars with heaving bags of overpriced food? No, they needed a little bit of glamour and a reminder that life was, indeed beautiful, so I brought in ex-HTV presenter Sam Mason to this end. Okay, Zygons aren't exactly TV presenters, but they do present a threat on television (much like a party political broadcast by the Conservatives) so I'm going to include them here. Now, back in the good old days, tea manufacturers were keen to provide a little bonus in their boxes of tea in the form of trading cards. It always made opening up a box of tea an exciting event as you never knew what would be waiting for you. However, it's a practice which has virtually disappeared. I wanted to remind the world of these simple, but fantastic delights, so I reunited a 1970s Typhoo trading card of a Zygon with a 2017 box of Typhoo in a supermarket.